Jeremy Corbyn, the leader of the opposition Labour Party, has all but promised that Parliament would vote down any deal that Mrs. May could strike. When Theresa May appears on stage at the Conservative Party’s annual meeting this week, it will take all her determination to drown out the ticking of an invisible clock. After two years of negotiation, Britain has reached a moment of consequence for the process known as Brexit. The insulating layer of time that had protected the country from a potentially failed divorce from the bloc is thinning. Soon, it will be gone, with the threat of major new trade restrictions closing in. What this could mean for ordinary Britons has been seeping into the newspapers, sometimes in leaks from secret government reports: Northern Ireland has only one energy link to the mainland, so a no-deal Brexit could lead to rolling blackouts and steep price rises; and the energy system could collapse, forcing the military to redeploy generators from Afghanistan to the Irish Sea. With an eye toward the March 29 deadline, the government has appointed a minister to guarantee food supplies. Pharmaceutical companies are planning a six-week stockpile of lifesaving medications like insulin and considering flying planeloads of medicine into the country until imports resume. That’s if planes can still land in Britain — something thrown into doubt after the government admitted that aircraft could, in theory, be grounded by a sudden exit. In many ways, the country is in the same position it was on the morning after the 2016 referendum: without a clear plan. British leaders remain mired in infighting, still presenting competing visions as the Brexit countdown enters its final stage. Supporters of a so-called soft-Brexit would keep Britain closely tied to European economic rules and standards so as to minimize disruption to trade. The hard-Brexit camp backs the opposite approach: quitting Europe’s customs union and single market and freeing Britain to draw up its own trade rules. On Friday, Boris Johnson, the former foreign minister and standard-bearer for the hard-Brexit faction, proposed starting over with a tougher negotiating approach, hinting that he might try to topple Mrs. May in the coming weeks. 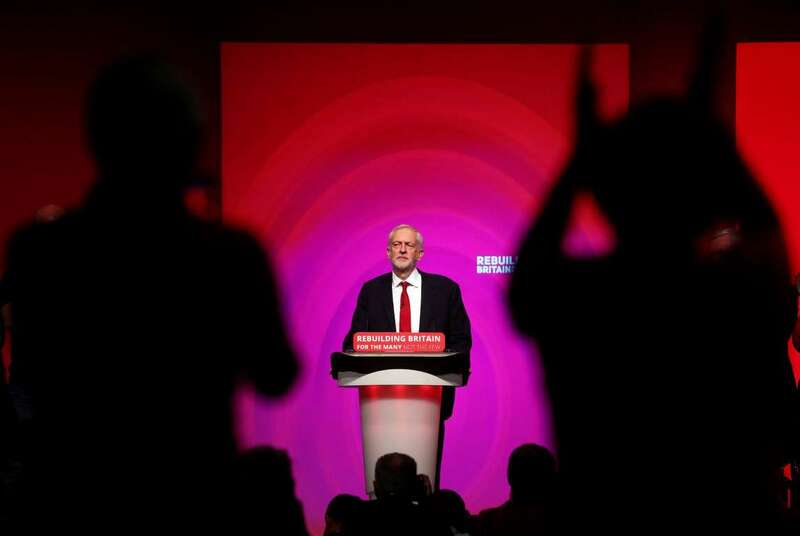 Jeremy Corbyn, the opposition Labour leader, rallied his own troops in Liverpool last week and all but promised that Parliament would vote down any deal that Mrs. May could strike. In the meantime, there is a strange calm, as if the country is waiting to see if a storm will make landfall. On Twitter, the novelist Robert Harris recently compared the atmosphere to the months before Britain entered World War I, when the authorities watched helplessly as they were dragged toward war by the momentum of events. “We’re just rolling toward the cliff, and nobody out there is going to stop it,” said Bill Wolsey, who owns a chain of hotels, pubs and restaurants based in Belfast, Northern Ireland. An abrupt Brexit, he said, would increase the cost of supplies and electricity in Northern Ireland by 20 percent and could curtail the flow of tourists from Europe, who are the backbone of his business. In the two years that have elapsed since the 2016 vote, Britons have been replaying arguments for and against leaving the European Union. Mrs. May’s supporters say privately that delaying is a good negotiating tactic, and that her leverage will increase as the cliff edge looms closer. There is some truth to this. Other European Union nations would be damaged economically by a disorderly Brexit. And her critics in Parliament, where she has no real majority, may agree to any deal she can bring back if the alternative is imminent chaos. Her team plays down the dangers, at least for now. “There are certainly risks of short-term disruption,” Dominic Raab, the Brexit secretary, said in a recent interview with the international media. Even if Mrs. May ultimately squeaks a deal through — and many believe she will — the spectacle of the two-year Brexit paralysis has permanently shaped international perceptions of Britain, said Cliff Kupchan, chairman of the Eurasia Group, a risk consultancy firm. If Mrs. May can reach a deal with the European Union and then get it through Parliament, that would trigger a 20-month period during which little would change while the details of future trade are worked out. In the meantime, many business owners are preparing for a worst-case scenario. Charles Owen, who runs bars and restaurants for British tourists in the Alps, made the “deeply painful” decision to sell two of his four venues. Still, the situation remains “scary,” he said, as some of his employees — many of whom are British — could lose their right to work in the bloc after March 29. A report from Barclays Bank suggests that an abrupt departure from the European Union would cost the food and drink industry 9.3 billion pounds, or about $12 billion, in additional tariffs, with a new average tariff of 27 percent. AstraZeneca, the pharmaceutical company, says it has spent £40 million to duplicate some of its facilities in mainland Europe so that supplies will not be interrupted next spring. This summer, one of Britain’s top health care regulators jolted diabetics by warning in an interview with The Pharmaceutical Journal that supplies of insulin could run out. Britain manufactures only a small fraction of the insulin its citizens need. Jim Moore, 47, a journalist who injects himself with insulin four times a day, has written about his anxiety over insulin supplies, notwithstanding the assurances he has received from officials.